Events have conspired to keep me away from this blog over the last week or so, but after a year of blogging about film I feel it would be remiss of me – with just a few hours to go – not to make a few comments about nominees for this year’s Academy Awards. Needless to say, there are films that I would have liked to see shortlisted for Best Picture but which weren’t. Under the Skin would be the film I’d have given an Oscar to; this, Foxcatcher, and Nightcrawler were, in my view, all vastly superior to American Sniper and The Imitation Game. However, the Academy Awards, like the recent BAFTAs, seem to exhibition a certain degree of conservatism. The main points of controversy have been the lack of recognition for black performers and film-makers, as well as the degree of dramatic license taken in many of the films depicting historical events. I have seen, though not reviewed, all of the films nominated for Best Picture and in some cases my view of a picture has changed since I first saw it. So, without further ado, here are my brief thoughts on the nominations. American Sniper I didn’t for one minute think that this was a pro-war film, but in retrospect I agree with many of the film’s detractors that it was problematical to view all events from the perspective of Chris Kyle. In particular, Kyle appears to swallow the falsity that Iraq was involved in the 9/11 attacks on the World Trade Centre and the Pentagon, but director Clint Eastwood does nothing to disabuse the audience of this myth. We also know from Kyle’s own book that the opening scene of the movie is inaccurate, albeit in a way that invites the audience to share his view of Iraqis as “savages”: the woman we see carrying the grenade did not, in reality, pass the weapon to a child to carry. Nonetheless, to my eyes – if not to some other viewers – American Sniper clearly showed the American invasion of Iraq to be a futile venture. But does this film deserve its Best Picture nomination? Not in my view. By a long way, this is not even Eastwood’s best film. Birdman (or the unexpected virtue of ignorance)Interweaving fantasy and reality, this is one of the more obviously dazzling nominees, with several terrific performances, a stirring soundtrack, and most of the film apparently shot in a single take. Michael Keaton excels in his role as Riggan Thomson, an actor who once starred as a movie superhero called Birdman, and who is now attempting to put on a Broadway theatrical production. There is obviously a degree of self-referentiality here, in that Keaton of course played Batman in two movies. Self-referentiality also appears when Riggan engages in fisticuffs with the volatile Mike, played by Ed Norton – who of course starred in Fight Club. Funny and inventive, Birdman is like Fellini’s 8½ remade by Terry Gilliam. I rather felt that the female characters played second fiddle to the men, but perhaps that simply reflects the way that Hollywood actually is. Boyhood Richard Linklater is one of the most creative directors in the business, with films like the Before… trillogy, A Scanner Darkly, Waking Life, and School of Rock to his name. Filmed over a 12 year period, Boyhood is undoubtedly one of the most adventurous projects undertaken by any movie director. Some might question whether the slender storyline merits an Oscar, but on the other hand it is the very depiction of the development of ordinary lives that fascinates the viewer. As the winner of the Best Picture at the BAFTAs, this may have some momentum behind it. The Grand Budapest Hotel Wes Anderson’s latest has all his trademark visual style, as well as a range of weird and wonderful characters played by many of the most notable actors in the business. Ralph Fiennes gives a brilliant comic turn as Monsieur Gustave H., the concierge for the hotel of the title as well as a self-confessed lothario towards the female visitors. In my view Fiennes should have been nominated for Best Actor. However, like most of Anderson’s films this one amused me but failed to be as funny as I thought it would be. The Imitation Game I was initially very enthusiastic about this film. It is funny, thrilling, and despite its intellectual subject matter moves along at quite a pace. I wasn’t sure at the time just how historically authentic this was, but assumed that a few liberties had been taken in order to enhance the drama. That’s fine – up to a point. However, from what I have subsequently learned I feel that this is a film that has stepped over a line. Benedict Cumberbatch is terrific as Alan Turing, but the simple fact is that Turing was not the socially awkward Aspergers-like character shown in the film. He had a sense of humour and worked well with his colleagues. Perhaps even more importantly, among the film’s fictitious constructions is the suggestion that Turing failed to disclose to the authorities that one of his colleagues was a Soviet spy (for fear that his homosexuality would be revealed). In effect, this depicts Turing engaged in an act that would have been considered treasonous, had it ever actually happened. On a more positive note, Keira Knightley is fantastic as Joan Clarke. Selma In many ways this is a brilliant and moving film. It follows Martin Luther King Jr, in the wake of the Civil Rights Act and his award of the Nobel Peace Prize. Despite the passing of the Civil Rights Act, which gave black Americans the right to vote, many southern states contrived various illegal devices to prevent black people voting. King attempts, unsuccessfully, to persuade President Lyndon B. Johnson to tackle the problem of the southern states, but the President is resistant, wishing to focus on the wider problem of poverty. King travels to the town of Selma, where he organises a series of increasingly large demonstrations. The violent response to these is widely televised, leading the President to finally take action. It is surely a major oversight of the Academy that David Oyelowo was not nominated for his excellent portrayal of King. However, this film also is not beyond criticism. It seems to have been generally accepted that President Johnson was actually far more sympathetic to King’s cause than is shown here. It is interesting to note that three significant Americans (King, Johnson, and Governor Wallace) are all played by British actors (respectively: David Oyelowo, Tom Wilkinson, and Tim Roth). 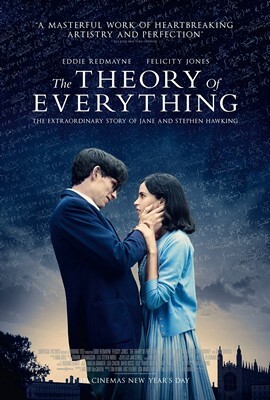 The Theory of Everything The story of Stephen and Jane Hawking, this could perhaps be a safe choice for the Academy’s voters. The cinematography is beautiful, the story moving, and the characters sympathetic. Jane and Stephen Hawking are said to have been very pleased with the film. Nonetheless, the film’s overarching romanticism surely airbrushes events that must have been far more difficult than is depicted here. Eddie Redmayne is brilliant as Stephen, as is Felicity Jones as Jane, and both are fully deserving of their Best Actor nominations. Whiplash In terms of pure entertainment, this is hard to beat. It’s the story of an aspiring jazz drummer who comes up against a teacher whose drive to create a new “great” tips over into outright bullying. As a story, it doesn’t have the same significance as something like Selma or The Theory of Everything, but the narrative construction is as tight as one of its own drumskins, and the final scene is more perfect than any of the other nominations. My verdict: Of the films nominated, I would give the Best Picture award to Boyhood, a film that is captivating and unique and deserves to be formally recognised as such. However, I wouldn’t be surprised if the Academy goes for one of the more obvious crowd-pleasers. For Best Director, I would have to pick Richard Linklater for the above-mentioned Boyhood. To put together such an extraordinary film over a 12 year period, whilst also making some other great movies, is a monumental achievement. I was sorry that Jake Gyllenhaal didn’t get nominated for Best Actor (male), for his role in Nightcrawler. I thought he was easily more deserving than Bradley Cooper (good though he might have been). This is a pretty tough category to choose from this year, though, with some stunning performances delivered. I rather suspect that Michael Keaton or Eddie Redmayne will pick up the award, but if it were left to me I would choose Steve Carell for his portrayal of troubled millionaire John du Pont in Foxcatcher. Some have said that this is more of a Supporting Role, but for me Carell absolutely dominates the picture. As I haven’t seen all the films in the remaining acting categories I shall refrain from commenting on those. Possibly the most egregious omission from the Oscars, in my opinion, is Mica Levi’s soundtrack for Under The Skin. I thought this was a country mile ahead of anything else in the year just gone. For Best Original Screenplay I would choose Dan Gilroy’s Nightcrawler, and for the Best Adapted Screenplay I would choose Damien Chazelle’s Whiplash. I have seen just two of the films nominated for Best Documentary, but frankly – in terms of sheer contemporary importance – I find it hard to imagine how there could be a more deserving winner that Laura Poitras’s Citizenfour. This documentary about whistleblower Edward Snowden reveals just how badly we have been lied to by our governments about the scale of intrusive surveillance upon ordinary people. And more than anything, it shows just how brave Ed Snowden is.